Teeth grinding, or Bruxism is the term for describing teeth grinding when you are not chewing. The teeth brush against each other with the forward, backward, or sideways movement of the jaw. In most cases, the person is not aware of the activity. Teeth clenching happens when a person keeps their teeth against each other with clenched muscles without jaw movement. It is common to see people grinding or clenching their teeth during the daytime, but most cases of bruxism occur when the person is sleeping. Sleep-related bruxism is problematic because it is more difficult to manage. It is a common sleep disorder and considered unmindful neuromuscular activity. The person may also experience an earache, partially because the temporomandibular joint structure is near the ear canal. Referral pain may also occur, where the person experiences pain in a different area from its origin. Other possible signs are depression, insomnia, anxiety, and eating disorders. The noise may also disturb people sleeping close by. In extreme cases, teeth grinding may damage the occlusal top of the teeth, especially the molars. This may aid temporomandibular joint (TMJ) syndrome. Although it is hard to pinpoint the primary cause of bruxism, multiple factors may contribute to the situation. Kids often grind their teeth after their first teeth erupt, and when developing permanent teeth. The act typically stops when their permanent teeth have fully developed. Stress also contributes to clenching and grinding, especially when the person is experiencing anxiety, anger, or trying to concentrate. Studies have shown an increase in heart rate and brain activity before teeth grinding starts, which means the central nervous system is also a contributor. Missing or crooked teeth may also lead to teeth grinding, mostly caused by irritation. The side effects of some medications such as amphetamines, antipsychotics, and antidepressants may include teeth grinding. Bruxism may be a result of neurological disorders such as Parkinson’s disease or Huntington’s disease. 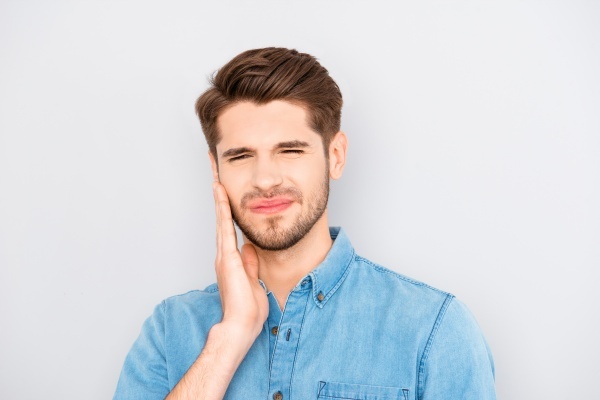 Some experts believe teeth grinding may also be due to an abnormal bite when the teeth do not align correctly when closing the jaw. An occlusal discrepancy is a term to describe teeth misalignment. However, this theory has no scientific backing. Other contributing factors are alcohol consumption, sleep apnea, snoring, and fatigue. In some people, the facial muscles spasm during sleep. In kids, bruxism may be their reaction to teething pain or dissatisfaction. Kids with ADD/ADHD may also grind their teeth. Teeth grinding is common among kids and rarer in adults, especially those above 65 years. The dentist may recommend mouth guard, splint, or jaw alignment to curb bruxism. Request a dental appointment here: http://www.riversdentistry.com or call Rivers Family Dentistry at (979) 710-2216 for an appointment in our Bryan dental office.